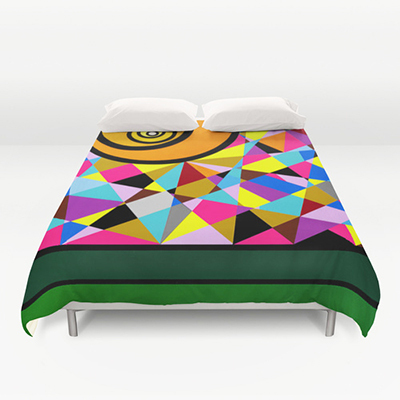 6 new Duvet Cover’s by Monty Montgomery Art are now available in the ” Society 6 Shop”. Each created from original paintings which can be viewed in “Portfolio” on the site. “Visuals in the Park” Montana Gold Spray Paint & Nova Color on Birch Panel 16″ x 20″ x 1.5″ is featured here on the Duvet. Cover yourself in creativity with various ultra soft microfiber duvet covers. Hand sewn and meticulously crafted, these lightweight duvet covers vividly feature your favorite designs with a light cream reverse side. A durable and hidden zipper offers simple assembly for easy care – machine washable with cold water on gentle cycle with mild detergent. Available for queen and king duvets – duvet insert not included. *The Nature Series* A body of work that is based on patterns, colors, and natural elements from various moments in nature.